As CNU becomes more globalized, many international students from different parts of the world want to enroll at the university. Just as the number of international students is increasing significantly year by year, CNU is doing its best to make sure that they are getting a well-qualified education and a happy life on campus. As obvious as it is, we know that the Korean language is crucial for international students’ lives, as they are required to use language skills in both their academic and social life while living in Korea. From 2018 March, CNU established a new program called Intensive Korean Language Training Course (IKLTC) for freshmen below the fourth-level of the Test of Proficiency in Korean. The Chonnam Tribune observed how IKLTC classes are conducted and listened to feedback from international students on their impressions and satisfaction with the courses. CNU requires foreign students who enrolled at the university this year to take the intensive Korean language course for one year. The program aims to enhance their Korean language proficiency so that they can take up major-related lectures or other educational training programs seamlessly in the second year. The credits earned by participating in this program will be counted towards the total credits required for graduation. The program is a mandatory course for those incoming students whose Korean language level is below TOPIK level 4 or level 4 from the Language Education Center, allowing them to take up to 18 credits per semester in the program. The Korean language classes will take place Monday through Thursday from 9 a.m. to 1 p.m. and continue, after a short break, from 3 p.m. to 6 p.m. The classes focus on Korean reading and writing, listening and speaking, grammar, vocabulary and pronunciation. Following the language lessons, the student’s schedule will depend on which culture classes they take, which can be either Korean society and lifestyle or learning Korean through media. The benefits of this new program are numerous. Firstly, after one year studying Korean language on Yeosu campus, international students do not have to worry about their life in Korea too much. Because of the confidence and knowledge gained in the IKLTC program, they will have much smoother and successful academic lives. Secondly, many classes from other majors would be completed within a year, which means international students would be able to focus on mainly their major classes during three years and to be more specialized on their majors. Last but not least, learning about Korean society and life will make their lives easier and it will be less hard to adapt to a new life in Korea. On the other hand, the IKTLC has some tiny weak spots. Due to the high number of beginners in Korean language, the need for beginner’s classes was high and the advanced classes were required less by international students. There are currently only beginner and advanced level classes. The absence of Korean intermediate classes for students is a problem. Students, who have language proficiency but not high enough, either have to spend their time reviewing what they learned or striving to catch up with higher-level classes. In addition to this problem, a curriculum about Korean culture and society are presented to classes fully in the Korean language. It is difficult for some students to comprehend the ongoing classes perfectly and they want at least these classes to be in English. 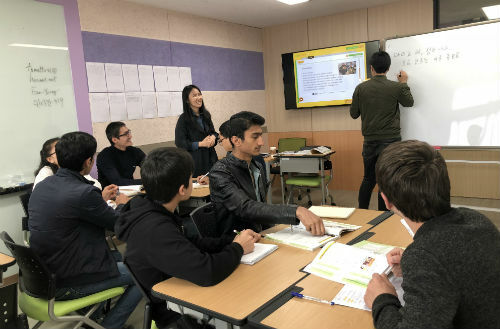 ”Due to the lack of teachers who can lead classes in English, we cannot provide English-based culture classes,” said Um Young-uk, the Director of the Language Education Center of Yeosu Campus. Moreover, as abovementioned, students are taking Korean language classes from 9 a.m. to 1.p.m. and after the lunch break, they are continuing with classes about Korean culture and society. It means they feel exhausted at the end of the day. “Spending all days and weeks might be a monotonous process for international students but on the grounds of the scarcity of budget we cannot organize many leisure activities and trips around Yeosu,” he added. “Although I had no idea about studying Korean language in Yeosu, it was quite exciting for me to start my semester here,” said Dyussenova Anel (Freshman, Faculty of Business Administration). She also mentioned that learning the Korean language is very helpful for understanding Korean society and people. Another student from Uzbekistan, Juraboev Farrukhbek (Freshman, Dept. of English Language and Literature) said, “Before coming to Korea, I also knew little about CNU and its curriculum, but meanwhile I was also worrying about the language barrier I would face in Korea. However, after coming to Yeosu to learn Korean language, I felt refreshed because it aided us to have better language proficiency and overcome difficulties we may encounter.” A Korean language instructor Park Su-mi said, “I am very excited to see international freshmen studying Korean language and Korean lifestyle which will come in handy in their future life to live well and on their academic studies. We are expecting to organize diverse field trips for them to make their time more joyful and unforgettable.” All instructors and staff members on Yeosu campus are doing their best to organize different activities and play various interesting games for students, in order to make foreign students’ lives interesting. 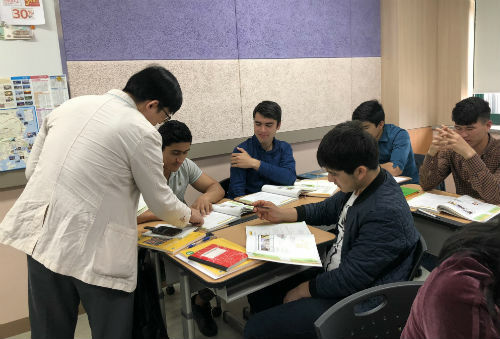 Thanks to the efforts of the staff and instructors on Yeosu campus, international students seem to be enjoying their time learning Korean language intensively. Director Um stated that the main purpose of this language program is to internalize and globalize the Yeosu campus and to help international students to undergo a happy life while living in Korea, by not experiencing language barriers and having trouble during their academic lives. ”One of the basic rules of the universe is that nothing is perfect. Perfection simply doesn’t exist. Without imperfection, neither you nor I would exist.” Like these great words by Stephen Hawking, this new program needs some improvements because of its advantages and problems, but the authorities of the university are working towards improving this language program and to live up to the expectations of international students. Hopefully, this language course will be a better program, and then CNU achieves the main purpose for which the program is introduced on Yeosu campus.